The new Arriel 2E delivers low cost, reliability and performance • 4,000 hour TBO at Entry-into-Service, with the targeted extension of 6,000 hours by implemention of our on-condition monitoring program. • Reduced maintenance costs via our innovative new monitoring system. > HIGH Reliability / Maintainability • Proven technologies and extensive experience. • New generation dual-channel FADEC: - Classic functions: automatic start protection and N1/N2 recording, automatic oil and fuel system monitoring. - HP blade creep-monitoring for additional savings. • Engine Data Recorder (EDR) - FADEC memory dump for faster data transfer. - Capture and store data enabling preventive maintenance. - Link to Turbomeca diagnostic services via an interactive secure internet portal (coming soon). • Arriel 2E provides all the power. Captains need for demanding missions, especially during take-off and landing. • The Arriel 2E offers a special 30 minutes power rating for occasional use. 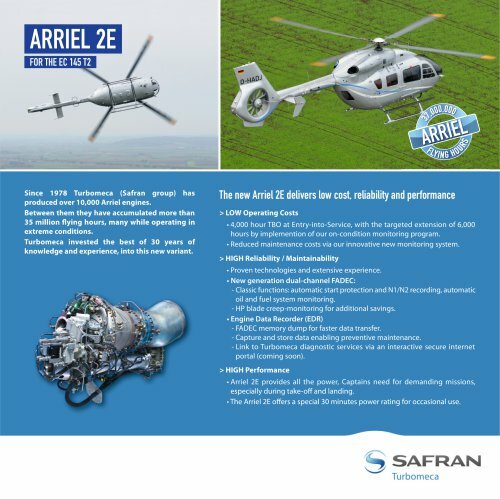 Since 1978 Turbomeca (Safran group) has produced over 10,000 Arriel engines. Between them they have accumulated more than 35 million flying hours, many while operating in extreme conditions. Turbomeca invested the best of 30 years of knowledge and experience, into this new variant.